Georgia Adult Education Association | Leading adults toward a better tomorrow! Leading adults toward a better tomorrow! Led by a dynamic President in John J. “Ski” Sygielski, HACC strives to create opportunities and transform lives, and the Office of Workforce Development will be crucial to achieving this mission. If you have any interest in this opportunity, please email me at haccworkforce@rpainc.org or call me at 800-992-9277. Although candidate materials will be accepted until the position is filled, for guaranteed full consideration, please submit a cover letter and résumé before March 28. If you have no interest in this opportunity but would like to nominate a friend or colleague, please contact me at the above email address or phone number. Your input is valuable, and I hope to hear from you soon. Thank you for your time and consideration. Savannah Riverboat Cruises is a treasured attraction on the Savannah River, for over 20 years we have had the honor of welcoming visitors and our local community on board for a memorable river experience and not just a view. Your conference attendees may buy into our scheduled cruises individually or I will help you plan the perfect group event for as few as 25 or as many as 600 and I will handle everything from food to entertainment. I will coordinate the perfect afternoon or evening experience for you and your group. You may start with one of our affordable pre-planned packages or I will work with you to customize according to your own needs. Call or email me for information and rates to begin planning your groups Savannah Riverboat Cruise! From the moment you embark, experience professional service in the spirit of traditional nautical entertainment. Enjoy live entertainment, delicious local cuisine, impeccable service and the sights and sounds of one of the “hippest” waterfronts in North America! Menu: Bourbon Peach Pork Loin; Prime Beef, Savannah Style Shrimp and Grits; Lemon and Artichoke Boneless Skinless Chicken Breast; Fresh Catch of the Day Vegetarian Penne Pasta tossed with Olive Oil, Spices, and Parmesan; Potatoes Au Gratin; Fresh Squash Casserole; Assorted Side Salads; Garden Salad with Dressings and Toppings; Fresh Cut Fruit Display; Bread Service, Choice of Dessert Service. Iced Tea, Coffee, Soft Drinks, or Lemonade. Description: A narrated cruise that takes you north on the Savannah River under the Tallmadge Bridge into the ports, where you’ll learn about their importance past and present. The Capitan will turn the boat around and you’ll head east on the historic Savannah River where you’ll continue to learn about our beautiful historic city. Boarding begins 30mins prior to the one hour cruise. Menu: There is no food included in this cruise; however, there is a snack bar and cash bar open on this cruise for purchasing snacks and drinks. Description: This cruise is truly a two in one deal! You not only get to eat on our beautiful riverboats, you also get to experience the fully narrated tour from the boat Capitan. 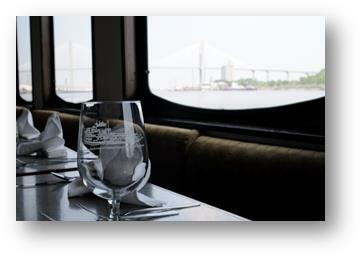 Come ready to relax and feast on a delicious southern buffet all while cruising along the Savannah River. Join us for a historic tour and delectable fare. Menu: Assorted Salads, Honey Glazed Pork Loin, Miss Franny’s Southern Fried Chicken, Chef’s Choice Special Station, Southern Style Turnip Greens, Creamy Squash Casserole, Sweet Potato Soufflé, Seasonal Fresh Vegetable, Fresh Seasonal Fruit, Dinner Rolls, Fruit Cobbler, Cakes, Brownies, Iced Tea, Coffee, Soft Drinks, or Lemonade. The following menu packages have been designed to give you an idea of the quality of our cuisine as well as spark your imagination as you think about the culinary experience you want to give your guests. Please keep in mind that we use only the finest and freshest ingredients in every dish, and that all menus can be customized to meet your vision, taste and requirements. Iced Tea, Lemonade, Soft Drinks or Coffee included. 20 photo pre-purchase minimum – photos must be pre ordered and paid for prior to your event for the discount. The Center for Continuing Education at Clayton State University will be launching a new program in February 2014 that will have a major impact on individuals, economic development and a growing industry in metro Atlanta… and provide another way to make dreams real. The Digital Film Technician Certificate program is a two-course program with day and evening classes that is designed to introduce students to production of digital media and film. Digital Film Tech Training I, scheduled to launch on Feb. 18, 2014 for the evening course and Mar. 3, 2014 for the day course, is designed for students with no background in digital media, as well as those students with some experience or coursework in the field. Digital Film Tech II, which will start in the summer of 2014, is a follow-up course designed to help students achieve a level of film/media production skills that will promote employability and/or the ability to become independent contractors. Both courses are designed, and will be taught by, Barton Bond, who comes to Clayton State from New Mexico with 45 years of experience working in electronic media, the last 25 years being teaching on the college level. Beginning in 1987 at Santa Fe Community College, Bond developed academic programs in electronic media production and digital media. In 2003 he developed and taught the first, and to date the only, film technician training program in the country, a program created in response to a pressing need for qualified crew members to staff the numerous Hollywood-based films being shot in New Mexico. With Atlanta rapidly becoming the Hollywood of the East, thanks to initiatives like the new Pinewood Studios in Fayette County, Tyler Perry’s studio expansion, and productions like “Catching Fire,” “Joyful Noise” (which included a scene shot on the Clayton State campus), and “The Walking Dead,” Clayton State’s Center for Continuing Education has brought Bond east to replicate that same program in the Southern Crescent. “New Mexico was the first state in the nation to offer financial incentives to attract films and TV productions from Hollywood,” says Bond. “And also the first and to date the only state to develop a comprehensive training program to quickly get workers trained at level that would allow them to work on film sets. “In addition to preparing students for feature film and TV productions, the program will also provide students basic skills required to work in other media projects like independent films, and commercial and industrial projects,” adds Winkler. Digital Film Tech Training I will deliver a complete basic skill set in the areas of production planning as well as on-set skills in lighting, grip, sound, camera, art, make-up, wardrobe, script supervision, locations and craft services. 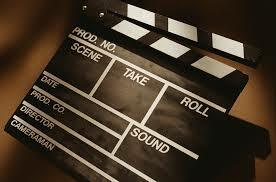 Students will also have the opportunity to participate in two, all-day Saturday film productions. Digital Film Tech Training II will develop and reinforce students’ skills in the areas of production planning as well as on-set crafts. The course will include working with members of the International Association of Theatrical and Stage Employees Local 479 (ITASE) and other credentialed guest lecturers. Students will be able to work on “real” productions, network with and receive mentoring from local production professionals. Class sizes for the two Digital Film Tech Training courses will be limited. For more information, call the Clayton State Center for Continuing Education at (678) 466-5050, or go to http://www.clayton.edu/conted/Digital-Film. Hello managers, supervisors, deans and directors! Here is a thought provoking message from Jack Welch about managing. In our hectic worlds of continuing education and training, we manage instructors, deadlines, programs, projects and possibly other staff members, how can we balance it all? In a word, that’s management. Balancing the demand for quarterly results with the pressure for a profitable future is what good managers do for a living. What do you think you were hired for? You were hired to wrestle a paradox-and pin it to the mat. And not just once, but over and over again. You have to eat, and you have to dream. It’s the same story with managing R&D (or program planning) . Obviously, you need to fund projects that will improve and expand your existing products. That’s usually money well spent, with relatively quick and certain returns. But some portion of your budget also needs to be earmarked for the kind of research that will deliver results in several years. Now, how much should go to each investment bucket? Your call, boss. Have your employees received a raise recently? Most state employees have not received a raise in at least five years. Consequently, morale has become an increasingly significant issue. As the job market recovers, will your employees maintain their allegiance to you or will they take advantage of emerging job opportunities? This issue and question have sparked a high demand for no-cost / low-cost employee appreciation strategies to help increase morale. There is a wealth of information available via the Internet on this subject and you are encouraged to research this topic further. Some basic Internet research found a number of existing employee surveys that overwhelmingly illustrated that the three most popular no-cost / low-cost employee appreciation strategies are allowing employees to wear blue jeans, work half-day Fridays and pizza parties. Below are just a few no-cost / low-cost strategies that you may wish to consider for helping alleviate low morale. I. Deliver candy, snacks, candles, lottery tickets, gift cards, flowers, tickets to a concert, sporting event, play, movie, etc. ***It is important that there be criteria for “awards” … if not, then employees won’t feel the intended recognition and find them to be random and possibly showing favoritism. “Rewards” are intended to be more like quick notions of appreciation and don’t necessarily require criteria but may still reflect favoritism … these should be somewhat few and far between to help minimize adverse responses by staff as a whole. Contributed by Peter T. Snell, Ed.D.